Author Ayden K. Morgen: What did I get myself into?! What did I get myself into?! Since I've managed to become the queen of not responding to email lately, I figured it was about time for me to sit down and actually let you all know I am still alive. Despite the random drive-by tweets, status updates, and otherwise odd silence, I haven't forgotten you either! In fact, I miss you. 2013 is off to a mad-dash of a start here. I've knocked out about half of my to-do list for the year in the last few weeks. Fall is nearly complete! I hoped to finish it before the insanity began, but didn't get quite that far. But I am in the home stretch, and we are slowly inching toward the finish line. Less than 10k to go, and I'm pretty dang excited about the plot for this one. You can expect lots of answers, a lot more questions, and maybe even a surprise or two for our wayward TA and his stubborn heroine. :) Woohoo! All in all, I'm thrilled! I'm still at the old job one day a week, as well. I couldn't leave. I love what I do there. Sadly, working part time on a non-profit budget just doesn't pay student loans fast enough. We are still packing for our impending move. And it is seriously impending. Three days! Eek. I should really stop finding excuses to not pack about now. But, you know, that's probably not going to happen. Every time I pack a box, I remember why I threw everything out five years ago and just bought new stuff. Packing is awful. It's going to be an interesting change for all of us. The new house is 20 minutes from town, and the gentleman across the road hosts pickings in his yard once a month, which is to say a bunch of people get together, drink beer, and play the banjo and guitar in his front yard. I live in the ghetto right now, y'all. The only thing we hear around here are gun shots, arguments, and sirens. No lie. So yep, lots of new happening here. Including a new car. Yay! The roads here have been awful since the Christmas Snowpocalypse. The South is in no way, shape, nor form prepared to deal with 10 inches of snow, and it shows. We have massive potholes all over the place, and debris still scattered around. Little Red, Part One was not able to cope. The check engine light came on and no one could figure out why it was on, or why the car was giving off a tar smell. Add two flat tires in two days... one of which blew in one of the worst neighborhoods in Little Rock at 11:30 at night while I was alone, and well, drastic measures had to be taken. I stole the husband's truck. When the second tire blew, I had no choice but to pull into a vacant lot and call the husband for a rescue. While on the phone with him, someone decided to pull up beside me and be all creepy. They kept coming back, circling the car with me stranded inside. Scared me to death, so SS promptly got new tires. And I promptly refused to drive the car since no one could tell me why the dang engine light was on and there was no freaking way I was going to deal with that level of scary again. I'm a chicken, and Little Rock is *not* the place you want to be stranded alone after dark if you're a woman. So I stole his truck for a week. He hated it. And by that I mean, he stomped around and whined for the entire week because he wanted his truck back and I wouldn't relinquish the key until someone fixed my car. Since no one knew what to fix, last Saturday morning, SS told me to get dressed so we could go buy me a new car for my birthday (yep, I had one of those this month, too!). Ayden: 1. The Husbinator: 0. Isn't it pretty? 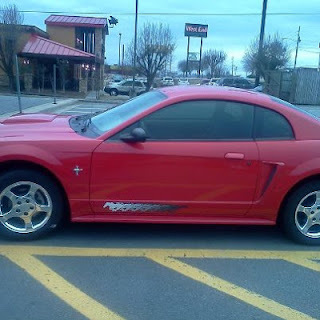 I wanted a Camaro, but then I saw this Mustang, and well, Bumblebee is just going to have to wait a while. I like Little Red, Part Deux. So does the husband. He got his truck back, and has a happy, safe wifey again. And, let's be honest, he's freaking loving having a new toy to play with. In the past few days, he's found every excuse possible to get behind the wheel. Seriously. Since when do you have to drive a car to test the windshield wipers?! Or to adjust the seat?! Anyway, that's the long drawn out story of how I got a new car, and where I've been hiding lately. I hope 2013 is off to a fabulous, and less busy, start for all of you! And that you will forgive me if you're waiting on email from me that has yet to materialize. I didn't forget. The boxes are just holding me hostage. Love Little Red Part Deux!! But I may have some bad news for you. Living in the middle of nowhere does not mean you won't hear gunshots all the time. You're just less likely to hear them after dark, they are more likely than not pointed toward an animal or a shooting target and you are probably 90-95% safer. I say this sitting in my house that is 2 miles from Interstate 44 and about 10 miles from the closest real town. Much to my very luck, the neighbors "down the ravine" from me (which really means about 2 football fields down a hill, past the pond) like to use their super loud black powder guns. For hours and hours and hours and hours and hours and hours and (did I make my point yet? I thought so.) etc. For two days straight, one shoots then reloads, and while the first is reloading the second shoots then reloads and it's an ongoing cycle for all of daylight at least 1 weekend (Saturday and Sunday) a month and sometimes all 4 weekends. Oh, and it echoes in their valley. I've thought it was an explosion before when I wasn't quite awake but got woken up at 7 or 8 in the morning. Yes, these are the people that are my neighbors. Of course I don't have the music people in my neighborhood. There is a church a mile up, but of course there's no drinking there, so good luck with those parties! !